FINALLY: Ken Block’s Climbkhana Pikes Peak Featuring the 1400HP Hoonicorn V2! - Muscle Cars Zone! FINALLY: Ken Block’s Climbkhana Pikes Peak Featuring the 1400HP Hoonicorn V2! As we will all agree, this guys has one of the wildest driving abilities, however putting his abilities on test can be very dangerous. 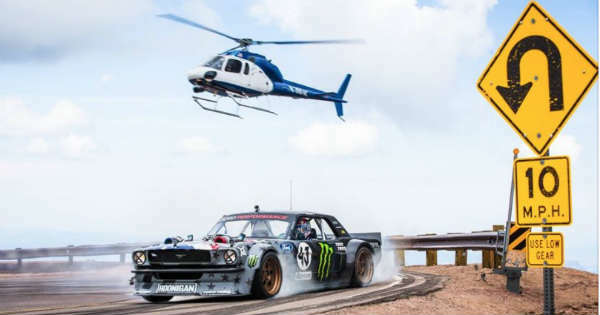 On the video below you can see the Ken Block`s Climbkhana Pikes Peak Featuring the 1400HP Hoonicorn V2 and see the moment when he is passing several inches from the edge of the mountain. He is really killing this monstrous custom made 1965 Mustang making this video one of the best that he has filmed. As you know all the race drivers that are riding on the Pikes Peak road, they are always trying to keep the maximum grip on the highway, but Ken Block is going sideways and is slaying the tires leaving massive smoke behind him. This is actually a MAN vs MOUNTAIN battle, 14,000ft high mountain versus Ken Block’s 1,400 HP twin-turbo methanol Ford Mustang Hoonicorn RTR V2. So, you can now turn your speakers on, turn up the volume to the highest level and enjoy this adrenaline rush with one of the best drivers today. Please feel free to share your thoughts with us in the comment section below and share this amazing MAN vs MOUNTAIN video with your friends on Facebook and other social media.